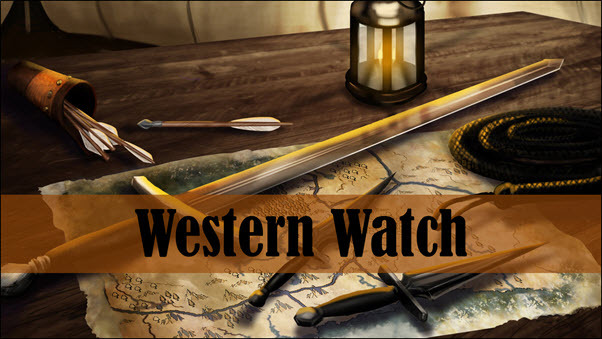 I’ve finished the first draft of Western Watch — Lady Merreth’s debut novel — and have done twelve chapters of the second draft. And … I have sort of stalled. Not sure why, but I’m lacking in motivation to push through to the end. I suspect that it’s because I realize just how much more work there is still to do. The second draft is really going to be nothing more than a cleaned up first draft. I will have fixed most of the technical errors (spelling, grammar, punctuation), cut some verbiage to tighten things up and attended to some of the more obvious plot issues. However, the heavy lifting — re-arranging scenes, major cutting (entire chapters), and fleshing out some characters — will not take place until the third draft. That said, the second draft isn’t bad, and thanks to the merciless critiques of my writers’ group many major errors have been avoided or fixed. So, I’ve decided to post some of chapters as a way of gathering feedback and motivating me to get going again on the re-write. Besides, some of you have asked to see some sample chapters (Hi mom!). To do something a little different, with each chapter I will post artwork created for that part of the story, along with links to the artist.